Born and bred in the Severn Valley near Bristol, Paul Rutter was surrounded by a natural world that drew him in and beguiled him. It was an experience that would inform his whole life as he worked on deer parks, for the National Trust, and now to protect the environment around his native Gloucestershire and Herefordshire. Passionate and deeply felt, Yesterday’s Countryside, Tomorrow’s Choices is not simply a lament for a world we are in the process of losing through the abuses of big business and the small acts of which we are all guilty. Instead, Rutter tackles the problems head on, and offers intelligent and comprehensive solutions to help all of us understand the environment, our place in it, and how we can make a difference. Drawing on his own life, from hands-on rural engagement, to his experiences in environmental advocacy, Rutter pulls us back to the world which we all share, and which it is not only our duty to protect, but our privilege to inhabit. 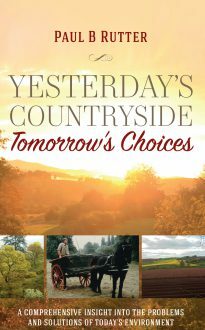 Heartfelt and humorous, Yesterday’s Countryside, Tomorrow’s Choices is a book that shows the reader not a lost world, but one that is all around us, and which we can help preserve.